Located 2.6 km from SeaWorld San Diego and 5 km from Old Town San Diego State Historic Park Coronado Condo Condo offers accommodation in San Diego. The apartment is 6 km from University of San Diego. The kitchen comes with a dishwasher an oven and a microwave as well as a coffee machine. A TV with satellite channels is featured. Other facilities at Coronado Condo Condo include a barbecue. Downtown San Diego is 10 km from Coronado Condo Condo while Balboa Park is 11 km from the property. 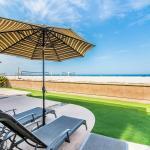 The nearest airport is San Diego International Airport 6 km from Coronado Condo Condo.